This particular Jupiter C, it’s serial number was 29, and that was coded in the missile. You see on the first stage just below the service structure the letters UE, those are the second, and ninth letters in the word Huntsville. Is this known to be true? What about the pairs 7/8, 17/18 and 27/28, which would be indistinguishable (within a pair) and would all end in "L"? Redstone was the first (or sole) stage of the Redstone, Jupiter-A, Jupiter-C, and Juno-1 rockets. The HUNTSVILEX code was used during the initial development of the Redstone booster. This source states that only 1-9 were represented (no X). 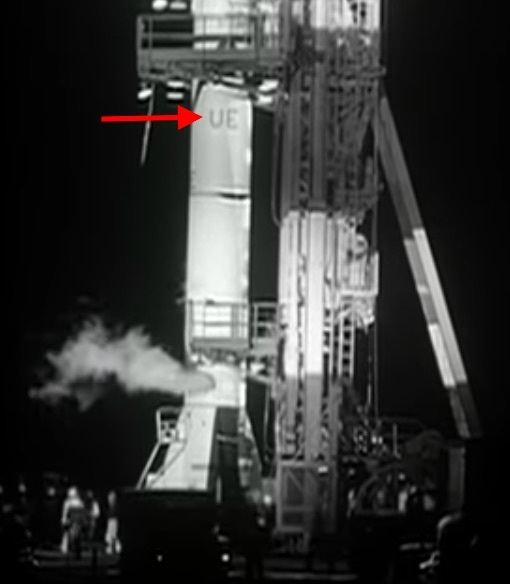 Lists codes for many of the launches, verifying that X was, in fact used. The fifth flight but the sixth vehicle, serial number RS-6 (encoded as RSXV). Not the answer you're looking for? Browse other questions tagged launch explorer-1 or ask your own question. What are the advantages of water-based sound suppression vs. cliff-based launching?